The 8th branded white label site has launched on the SourceAudio platform since February 1. 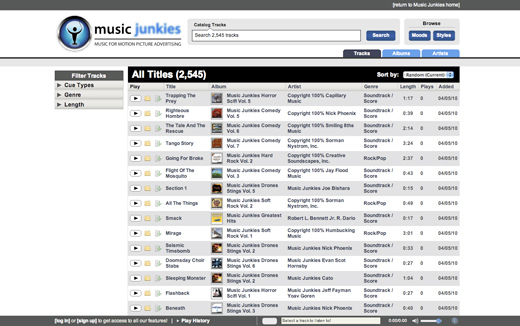 In addition to this, Music Junkies’ “Music For Motion Picture Advertising” catalog is the latest addition to SourceAudio’s music aggregation destination at sourceaudio.com taking the total number of tracks available from streaming, saving, sharing, emailing, downloading and licensing to over 161,000. « Site Updates – Improved Search and Other Awesome New Stuff!